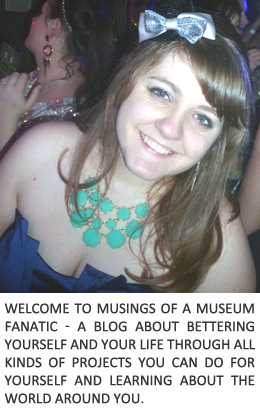 Musings of a Museum Fanatic: Being all productive and whatnot!! First off go enter the giveaway I'm hosting (if you haven't done so already)!! Stephanie is pushing up our monthly link up a day so let's catch up and see how everyone is doing on their goals! I actually feel pretty good about how I did this month. Honestly I didn't end up doing all that great on the five goals I set out for myself last month but I did get some other items checked off. The one item off the list I did accomplish was putting in an extra loan payment woo! I think I was actually able to pay it towards the one with the highest interest too. While I can't ever seem to made a to do list and stick to it I did get some other 101 list items in the works and accomplished! My good friend Jackie and I ended up making homemade pasta last weekend. Let me tell you it turned out awesome. We are still super impressed with ourselves, especially since we left out an ingredient! Keep an eye out for that recipe coming up soon : ) I actually double dipped with that one ... homemade pasta and a recipe from one of my 70 odd cookbooks. Kevin and I are burning through that 101 task as well. The Pampered Chef spiral cookbooks make it really easy to choose a recipe from each and leave the book open until we've cooked it. Working from my other ones might be a little more difficult plus I've already packed up a bunch of them so I need to exchange some out. Checking out my list again I seem to be lacking in the Bettering Myself and Husband categories. I think those are going to be my top priorities the next month for sure. 2. Figure out which three classic movies I want to see ... suggestions welcome! 3. Looking into the pricing of the dance place five minutes from our house. 5. Finish up the birthday/anniversary calendar. How are you doing on your goals the past month? Well good luck with your goals. I probably should do this too lol It may help me stay on target to achieve some things.